Are You Serious About Getting Your Very Own Automated Ebook Website? Heres How To And You Can Make Money From Amazon, Google Adsense Too. . .Guaranteed! Complete Store Running On Autopilot! 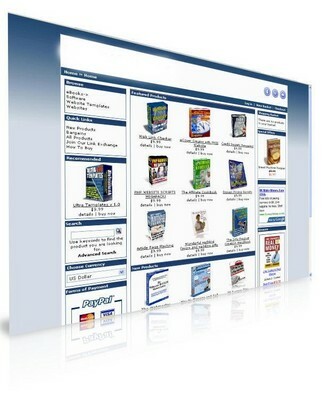 Everything can be configured though an easy to use web-based Store Admin Area. This great Instant Product Download eCommerce Store is a complete PHP/MySQL shopping cart system and a profitable online business, that requires no previous web experience, The site is integrated with PayPal IPN (Instant Payment Notification). This Download eCommerce Store has an admin area where you can Manage your Download Store online without knowing any html or php or any web designing language, Its that simple designed, from the admin area you can easily add or edit unlimited products, complete with pictures, descriptions and prices. You can create unlimited categories, you can check your customers orders, upload your own banners of your affiliate programs and other websites, send email newsletters to your customers ( great way to tell them about your new products), add your own keywords and meta tags through your Admin area to help your search engine ranking, with an automated links page for exchanging links with other websites which would be great for getting page rank for search engines, also comes with Google AdSense built in! Simply insert your Google Adsense ID and earn more money! This great Download eCommerce Store is integrated with PayPal, Nochex, Worldpay and Stormpay, Accept online credit card orders with these popular payment methods. GBP£, USD$, Euros, Australian$ and Canadian$. Easily add your own eBooks and downloadable products, complete with pictures, descriptions and prices. Easily change the prices and edit product descriptions to your own taste. The purchase can only be downloaded once, so the customer cant pass the download link around to friends. No need to add PayPal buttons. Simply enter your PayPal email address in your Admin. Thats it! Works with UK Pounds, US Dollars, Euros, Australian Dollars or Canadian Dollars. Upload your own banners to your affiliate programs and other websites. Displays random featured products every time the front page is visited. Includes an easy to understand PDF installation manual. Im Ordering To Save A Massive $70 Right Now!